Feedback: 112 comments - leave yours! Many Italians do not know about guanciale. Italy is a large country and regions are very different from one another. People from the North will cook Spaghetti all'amatriciana, a dish from the center, with pancetta and parmigiano. They might even give you a funny look if you mention they should have used guanciale and peccorino. But this unique bacon is nothing like pancetta. It gives an enormous amount of porky flavour to the sauces and your guests will wonder where it comes from as they hand their plates for more. Every single time I've spoken about guanciale to Italians who knew about it, people told me how they used it with an immense smile. "Oh me I just cut some thin slices and put it over the salad with croutons and hard boiled eggs" a lady in Bologna told me, "but the best is to cut it in minuscule dices, fry them with no extra fat and them add beaten eggs. The very best omelette you can make". And so on. You can hit your 'Mama's extra authentic cookbook' all you want, they will probably not mention it because the fact is, you can't find guanciale outside Italy. This restaurant in New York City claims to make their own guanciale, complimenti if it's true. And even in Italy, it is widely available only in some regions. Elsewhere people will assume, since you are a tourist, you just mixed up two words. If you're Italian, the would think it's a dialectal name for pancetta. But it's not. Guanciale is made from pork cheeks (very fat porks apparently). 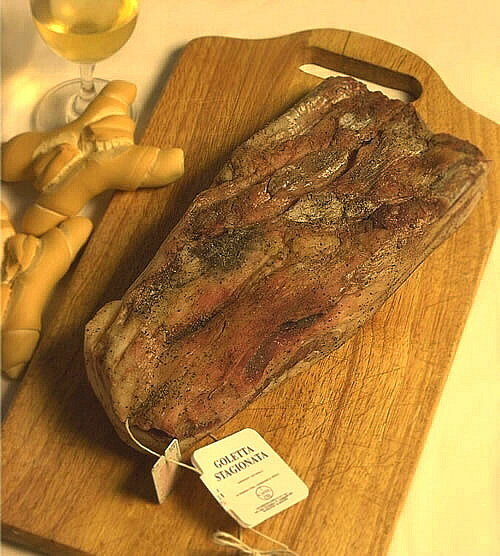 The meat is washed in wine, seasoned and left in a stone niche for 40 days to marinate. After that they hang it to dry and presto - you can eat it.You don't really eat raw guanciale - it is a highly savory piece of white pig fat better used for cooking. You melt it down in a saucepan and use the fat to fry further ingredients who will become infused with this amazing taste. It is not part of any diet I've come across, but even a small quantity will get you the taste, so it's worth trying even if you are dieting. On the picture above you can see a collection of 3 types of guanciale hanging from the ceiling at Volpetti's in Rome, a good place to buy guanciale. They don't cost much and you can store them in the fridge for many months, using only bits at a time. If the end becomes tainted, all you need is cut a slice and disregard it and the rest will be perfect. 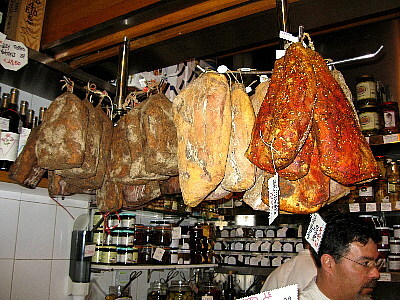 To buy guanciale, try any food shop or salumeria in Rome, its place of origin. Ask for guanciale (gwantshiaaaaaleh) or Barbozzo, a cousin from Umbria, barbaglia or barbagia, or even goletta made from the meat below the jaw that unites both jowls. If they don't know what it is, write it down. If they still don't know or show some pancetta or coppa, saying it's the same, thank them and move on. They don't have it. I visited a number of shops in Bologna but managed to track down two magnificent specimen in a large salumeria. Please let me know if you see them elsewhere and send me a picture if you can. Try La Quercia USA (they have a website). Produced in Iowa from Berkshire pork, these cured artisan pork cuts are the finest quality found domestically. Hello Jay, thanks for the comment! Will you try to make your own guanciale by seasoning and drying pig jowls? Hi guys,In New York, you can buy guanciale in a very small salumeria called Salumeria Biellese (Eighth Ave. and 29th street).They have a website (salumeriabiellese.com).I am not sure if they do any delivery. Leila I am so glad you decided to buy Paul Bertolli's book, it is one amazing work. I am very curious about your making your own meat. My uncle Harvey had built a meat drying room in the back of his chalet and we used to make sausages together, and he makes Valaisian dried meat, but never guanciale. Let me know how it works out! Mike, unfortunately I don't know where to buy guanciale even here in Switzerland, let alone in DC. Your best bet is to call up the best Italian restaurant in town and ask them where they would buy it. If the chef is not Italian or at least Italy-trained he probably won't know what you are talking about. I've spoken to the fresh-of-the-boat Italian owner of a salumeria (Italian dried meats shop) and he didn't know what it was and tried to sell me coppa or pancetta. Good luck, it is well worth the search! At last you found a source for guanciale in America! Do you know what type of guanciale they sell? Is it seasoned with peppercorn or chilis? Thanks for the tip! Odi, this is a great idea! Just make sure they understand what you mean, in some parts they call it goletta (pig jowl with the neck). Maybe you should show them what part you mean to make sure. Otherwise buy it from Volpetti in Rome. Good luck! Dear Francois, my tesa is now air drying in my loft and has been so for the last 4 days. I inspected it today and it looks fine and smells very good. Unless mold starts to appear, I intend to let it hang a further month or so.I have just purchased a wonderful book called Charcuterie by Michael Ruhlman & Brian Polcyn with lots of mouthwatering recipes for homecuring meats and sausages. Leila, thanks for the update on your home drying! The books sounds very interesting, I'll look into it. Enjoyed your article about guanciale. Learned about it recently, but here in upstate NY wasn't sure where I'd find it. But I go to a German butcher nearby who handles more pig than any other meat, so I asked if I could get cured pork jowl, but not smoked. He said, no problem, to give him 3 days notice and he would have 1 or 2 ready. I ordered one and have made bucatini with guanciale twice. I do realize that this is not authentic guanciale as it would be prepared in Italy, but it is essentially the same product, and I'm loving it. I liked the article especially after just buying 2 pig jowls and not knowing what to do with them. I thought that was guanciale. So, I will try curing it. BUT, BUT, alarming is the ad right next to the pix for "losing belly fat in 10 days." I think I am fixin to put some on. Doug thanks for your visit of FXcuisine.com and let me know how you get along with the homemade guanciale! I am sorry if Google ad-sensed that this was a very fatty product and suggested weight loss. But the ad would have been even better targeted with 'Lose your jowl-fat in 10 days' for such a product! I made a basic risotto the other night, but started by frying 1/4 pound of diced guanciale. Instead of using just olive oil to saute the onion, I used half olive oil and half fat rendered from the guanciale. I continued making a basic risotto with grated parmesan, then added in the fried, diced guanciale at the end and finished cooking. The risotto had a nice buttery pork taste, and the little fatty guanciale pillows added nice texture. Everyone enjoyed it. Sounds very nice W.C. Wood, did you add some herbs? I would guess rosemary would work nicely with this manly risotto! Where did you find your guanciale? Thanks. This evening I've just had an experience similar to W.C. Wood's, only in southeastern Michigan. Wanted to try a meat ragu recipe that called for pancetta, but, wanting to cut a little corner on an experimental venture decided to try cured jowl, a product with which I'm familar from the family's Southern kitchen.The result from using the copious rendered fat instead of most of the o-oil, and adding the crisp meat to the slowly cooking stew, was tremendous, and the dish was satisfying in much smaller than usual portions.I feel like telling everyone, "We were wrong! We had no idea what we were doing! "Thank you for your nice article. Amazing! Just so other US readers can get guanciale/cured pig jowl, where exactly did you locate this treasure? A few weeks ago I went to Florence and headed right for a favorite butcher (La Norcineria) very near the Central Market to see if they had guanciale. "Si, Si!" exclaimed the clerk, who led me to a basket of unprepossessing chunks of this sublime cured hog jowl. I bought her largest piece and smuggled it home vacuum-packed and wrapped up in a pair of jeans. Since then I've been nursing it carefully; but my own homemade guanciale, made to Batali's specifications, is every bit as good, and very easy to make--compared with going to Italy and smuggling contraband into the US. This is not to say that I no longer have any reason to return to Italy!As for finding the fresh jowls... I live in the remote mountains of Maine and first thought finding this specialty item would be difficult. With one phone call, a local organic butcher came through, and the jowls were surprisingly inexpensive. I think they're viewed almost as a by-product. I LIVE IN WASHINGTON, AND OUR LOCAL WINCO CARRIES SMOKED PORK CHEEKS, VERY INEXPENSIVE AND FLAVORFUL, I USE IT WHEN I MAKE CARBONARA. Richard, I am so glad your homemade guanciale compared favorably with the 'real' thing bought in Italy! But the taste of contraband jowls is inimitable. leila and FX; Thanks to both of you for the information on how to make and what to do with guanciale. As I have yet to meet a pork product I didn't like, I will try making this when we butcher our next pig. Special thanks to you FX for posting your blog in English. You have most certainly broadened the culinary horizons of this American. I found guancilae at Dean and Deluca in SOHO NYC. I've made Pasta Alla Gricia twice so far....delicious! I managed to get hold of some 'guanciale' and 'guanciale affumiciato' from Bologna. 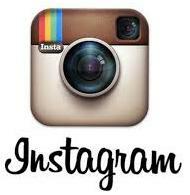 I want to send you some images. What's your e-mail ? Thanks for a great site - it's the 'tone' as well as the content (very inspiring) - none of the intellectual masturbation - just honest tried-out opinions. Food without the story is not the same. One Indonesian cook in Portugal once told me, cooking is the link between the earth and heaven !! For me it's a great occasion to have some fun and discover (lots of things). we sell imported guanciale at Micucci Grocery here in Portland, Maine. I bought some guanciale at The Fatted Calf in Napa, CA. You can order guanciale on-line at NimanRanch.com. They are based in central CA and have very popular meat products here on the West Coast. I have longed for this jewel as I have watched Mario and Lidia cook with it for years. I just ordered some and can't wait to get my hands on it to make an authentic Amatriciana. I had this dish in Rome and was totally blown away. Thanks, fx, for inspiring me! Lynn, thanks for visiting and congratulations on finding some in the US of A, that is no mean feat! Have fun with your guanciale. I am currently working for a few months outside Milan and someone gave me a recipe for Spaghetti alla Carbonara which required said guanciale. I found some quite easily in the local shop. Anyway, I was hoping you might do this dish justice at some point with your great photos and instruction as mine did not come out to satisfaction. Are we allowed to make requests? Love your site. Callum, I am not a fiend for Carbonara as much as for Amatriciana but I'll see what can be done to have an article about it on FXcuisine.com! Down side was our beloved government of India has changed its laws and now bans the import of meats and plant matter...... so i had to bribe the customs officer to get it in. Truly a case of greasing fingers for the privilege of bring home some grease. Abhijit, this was divine grease you used, did the custom official ask for a piece of guanciale? I just made a Guanciale Risotto. I sauteed portabellas, onions and artichoke hearts with a little fresh rosemary in some of the drippings and proceeded with the risotto. At the very end I stirred in white wine, freshly grated parmesan and ementhaller and the crispy rendered Guanciale. Topped each plate with some freshly chopped parsley and truffle oil. Absolutely amazing! FX's answer→ Valerie, this sounds very nice! Are you sure you need all those flavors - it seems like maybe you might do 3 different recipes with all of these ingredients. In Vancouver one can get guanciale on Granville Island at the Public Market. $6.99 CAD! FX's answer→ Well done Chris! Babbo is Batali's restaurant....if they claim to make it, then they most likely do. "You don't really eat raw guanciale..."
Surely, you jest! Of course you eat, and can enjoy this beautiful and flavorful cured piece of pork! It is no fatter than many a bacon and can be enjoyed by frying up just like bacon, or on a cracker like any salumi. I first tasted GUANCIALE in Chicago at La Boca Della Verita. They make their carbonara with it. They get it at a local butcher in Lincoln Square who makes it for them. I also know chefs in Kalamazoo that get it from local producers. Homemade guanciale is simple, once you've done it once or twice. I have so much, I can't possibly use it all, I give it away as a gift. (people treat it like gold). Simple, no curing chamber or curing salts even necssary, you can cure it in your home refrigerator. There is a new company in Milwaukee Wisconsin making excellent guanciale, pancetta, Berkshire prosciutto etc. called Bolzano Meats, (www.bolzanomeats.com) They sell the guanciale for around $15/pound plus shipping. FX's answer→ Thanks for the tip! There is a Federally inspected meat company in Salida, Colorado (Scanga Meat Company) that does suppressata salami (excellent quality). And by May 2010 will be producing pancetta and guanciale. It is family owned by Italians who descended from the District of Calabria. Your article is excellent, refreshing, and a very nice illustration to boot. Do you think that people should be cautious about following home recipes especially without the use of curing agents? FX's answer→ Fantastic! I trust home recipes, if the meat turns bad it shows all right. I don't trust industrial recipes and trigger-happy butchers who put twice the salt needed though. I've been buying guanciale for years from Darrel Corti at Corti Brothers in Sacramento. Until I saw this article I had no idea it was so rare for Italians to know what it is. If you are a fan of making your own flour...............have you heard of or tried a thermomix? FX's answer→ Yes, it's an interesting appliance and I might buy one some day! If you haven't tried Scanga Meat Company's Guanciale, Pancetta, and Suppresatta, you haven't lived. These are authentic Calbrese delicacies. I just returned from my first visit to Rome. Many years ago, I was a meat-cutter in Connecticut and have always been interested in cooking. We visited several salumeria and meat markets because of my fascination with the way the same animal is prepared for retail sale in various areas. The highlight of my trip was a visit to the incredible enclosed market on Via Andrea Doria which has about one hundred stalls offering fruits, vegetables, fish, clothing, gadgets and, of course, meat. "Sauveur" magazine had done a recent article about authentic Roman cooking, using the finest of fresh ingredients in the most simple of recopies. One of these recipes was for Pasta Carbonara which is properly made only with guanciale. I found my "golden flesh" it in a little shop featured in a two page spread in the magazine and bought my first guanciale. The owner of the shop's English was worse than my Italian but he was thrilled to get a copy of the magazine which he had never seen. He told me (I think) that he would frame and hang the picture in his shop. He has wild boar heads mounted on the corners of his stall. I smuggled my little treasure into the country last night. It sits now in my refrigerator ready for me to try later today. I came across your excellent site on my quest for recipes for guanciale. You are definitely going into my favorites and I plan on consulting you regularly in the future. FX's answer→ In such simple recipes the right type of ingredient (ie guanciale vs pancetta) really makes a world of difference. The name of the place here in Los Angeles is called The Wine House in West LA on Colter. Excellent wine selection, knowlegable staff (although I now understand why nobody knew for sure just what this fatty bacon thing was) and reasonable prices. And super cheap wine tastings on Saturdays! FX's answer→ Jake, you can use guanciale in very simple recipes (just on a piece of toast) or as a basis in a ragù, to give a little hit-me-back kick. Last night we sampled some guanciale from Salume Beddu here in St. Louis as part of a cooking class hosted by Mark Sanfilippo. All I can say is that pancetta or any of the other "bacons" are a poor substitute. As best as I can tell, Mark & Ben make theirs as authentic as can be found on this side of the pond -- washed in wine, heavily spiced and then aged/dried for some time. Truly a treat! FX's answer→ Indeed a treat it is! Thank you for all your great recipes and in-depth articles! For UK reader's (I'm not one of them) you can buy guanciale from nifeislife.com an online delicatessen. I bought a whole piece and have enjoyed it several times recently as part of a genuine carbonara - alla gricia is next. Will try to make it myself and have checked that my butcher can supply the jowls :-) So if the first Norwegian guanciale turns out to be a success I will definitely send you a picture! FX's answer→ Thank you Erik, our list of suppliers is expanding by the day! FX's answer→ Thank you Sonny. FX's answer→ Fantastic, Armandino, continue the good work! Made it to Volpetti's today and bagged some gianciale for me and friends back home. Now, to get it back to Canada and through customs. FX's answer→ Good luck for your trip through the customs! 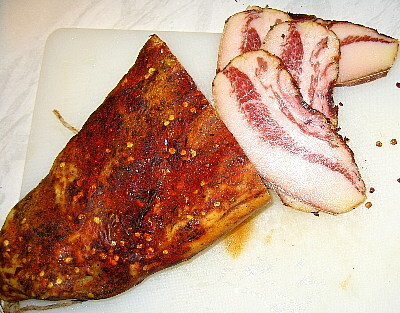 Picked up some (pepper) Italian guanciale here in Prague and have been experimenting with it. Very nice stuff. By and away the most informative thing I've found on the web. God how I love the Internet!!!!!!!!!!! I enjoyed the article very much. I especially appreciate the correct pronunciation of the word. I'm making my own right now. I just finished mixing salt, sugar,peppercorns, fresh thyme and garlic. It will stay in the fridge for a week and then will hang for 3 weeks. My recipe is different than the one you describe, but I'd love to find this one. I breed Berkshire pigs that live on pasture and in a hardwood forrest with lots of acorns. I've made some great pancetta, sausage and all the other great cuts of meat from this amazing animal, the pig. I don't think you can raise a better animal for meat. Yum! We have just ate the most wonderful pasta with guanciale in the province of Rieti n Lazio. It is called pasta alla gricia and the overall result is a dish of such sublime delicacy, I can still tatse it after 2 weeks. Try it. FX's answer→ Glad you had a good time. good article. I have ordered jowls from a butcher for next week. Would love good receipts for making guanciale. We must be very lucky indeed in the San Francisco Bay area. We have at least one restaurant in SF that makes their own guanciale, Barbacco SF, and we also have Boccalone, an old style salumeria, who believe in using the whole pig, snout to tail. Their guanciale is incredible, and it really exist, because I will be serving it at my New Years Day dinner. Luckily for the rest of the US, they ship. Google the business name, and mange! FX's answer→ Yes Rob I think you are lucky, this is quite a range of nice ingredients within your grasp! Everyone should know that Italy is not the only culinary culture to prize cured pork jowls. My early years was on a farm in rural North Carolina. Almost every family raised, butchered and cured their own pork. One of the most coveted cuts of pork was the jowl. The pork was butchered in during the cold months of the year, usually November thru January early. Freshly butchered pork was coated with a mixture of salt and pepper and kept in the smokehouse until early spring. Once the weather warmed the meat was washed and coated with another blend of peppers and hanged in the smokehouse where it was allowed to age until used. There was not refrigeration. Pig heads including the jowls were cured in this manner. Some cured pig heads were boiled whole for festive occasions. Often times, slices of cured jowls were incorporated in vegetable dishes. For breakfast, slices of jowl were cooked to a crisp as bacon. Greens and beans cooked with jowl in the place of regular fat back or pork belly were considered a treat. There was nothing like crisp jowl with sauteed green apples. Due to my own experience of the culinary delights of a rural farm, I can appreciate the culinary buzz over guanciale. FX's answer→ Thanks Sterling, I did not know that but as we say, in the pork only the hooves are not eaten so clearly nobody would leave those delicious jowls to eat! But few people salt and dry jowls outside Italy. Thank you for your great article. I hope you are still having a good time in the kitchen and charcuterie. n.d. I just bought some at my local Whole Foods!!!!!! Carbonara here i come! Just found some at the 125th street fairway in NYC. It was extremely reasonable, $4 per quarter lb. excited to try it in some of my pastas. FX's answer→ Good find Ashton, I hope this became a staple in your pantry! It is always a thrill to read about something totally new to my kitchen. I can't get it here in Mexico, probably, but will look forward to my next trip to Rome. FX's answer→ I hope you finally got your hands on some guanciale, Barbara. Cara, I just made it for dinner and I love it!!! Simple pasta to make and dioucelis! I love that it requires so little ingredients! I am always looking for recipes where I don't have to go buy ten thousand things I don't already have in my kitchen. I went shopping for the stuff and thought to myself, That's it? Am I missing anything? Thanks for the easy recipes! I am going to try everything! That's wonderful, Bao! Congratulations on being the first to try a reicpe and let us know how it worked. La Carbonara is a classic reicpe from the city of Rome you're an honorary Roman once you've made that dish. Your toga is in the mail. FX's answer→ Thanks very funny, may I be a Centurion? I live in Italy and spaghetti cnrobaara is one of my favorite restaurant dishes. There are many variations of this recipe but your version seems to be essentially identical to those claiming to be classico italiano . All agree it's Roman; some say it's ancient but most say it's from WWII. Nearly all call for long pasta, guanciale, and Pecorino while prohibiting the use of cream. A few prohibit Parmigiano-Reggiano, but many use a 50/50 mixture as you did. A few versions use short pasta and/or include garlic or Basel, or hot peppers. Some serve the intact egg yolk on top so that the diner can combine it with the pasta, but that strikes me as a bit risky especially if the yoke is served in the half-shell or if the pasta cools off too much. Most Italian recipes I've found use cheese which is more finely grated than you show in the video and that might help to make a more creamy sauce. Usually the quantity of guanciale is a little more generous, it's normally cut into 1/4 inch cubes, and cooked until crispy. Most also use finely ground pepper rather than course ground you showed, but these are tiny variations in the overall scheme of things and I think you've done everyone a big favor with your very authentic recipe.Interestingly, a few Italian cnrobaara recipes don't include any back pepper at all. Last week I had some taglierini (thin tagliatelle) cnrobaara served in Piemonte (well north of Rome) without any detectable pepper. Some years ago spaghetti cnrobaara was served to me in Rome and after plating the pasta, it was completely covered with a very generous coating of finely ground black pepper nearly obscuring the pasta itself. It really lived up to the name. Both extreme variations were delicious. FX's answer→ Ah the Italians can be very conservative when it comes to classic dishes with many Doctors of the Law, but I think in this case they are right. I saw a variation using smoked pancetta instead of guanciale, very interesting too! I dont know in italy, but in rome everybody knows the difference!!! You can get Guanciale at Salumi or DeLaurenti's in Seattle. You can get smoked guanciale by mail order from Virginia Traditions located near Williamsburg, VA. The price is right and they are great people to buy from. OH MY GOD! This looks so good, I've always wetnad to try making Carbonara but every recipe I found was made with cream and I'm lactose intolerant. I can eat cheese as long as it's of the hard variety (TMI I know!) so this recipe works for me. I am just curious if the last yolk you placed on top cooked very much before you ate it? FX's answer→ No cream in traditional carbonara. Usually you place the yolk right before sending it to the table but if you like cooked yolk or fear raw eggs you might try to mix it with the still piping hot pasta to cook it off, but that would be a pity. Glad you liked the recipe! volpi salumeria in the st. louis little italy (the hill) has guanciale. in fact, i just bought some and googled it because i wasnt entirely sure what it was. I attempted to bring a hunk of guanciale and some bottarga into the US from Florence. US Customs confiscated the guanciale but let me keep the bottarga. I think the guy was so confused by it, he just let it go. FX's answer→ I think they kept the guanciale for themselves!